A few months ago, we asked “can local save mobile ads?” The idea is that local relevance can be a source of premium advertising, and reverse the trend of depressed ad rates in mobile. 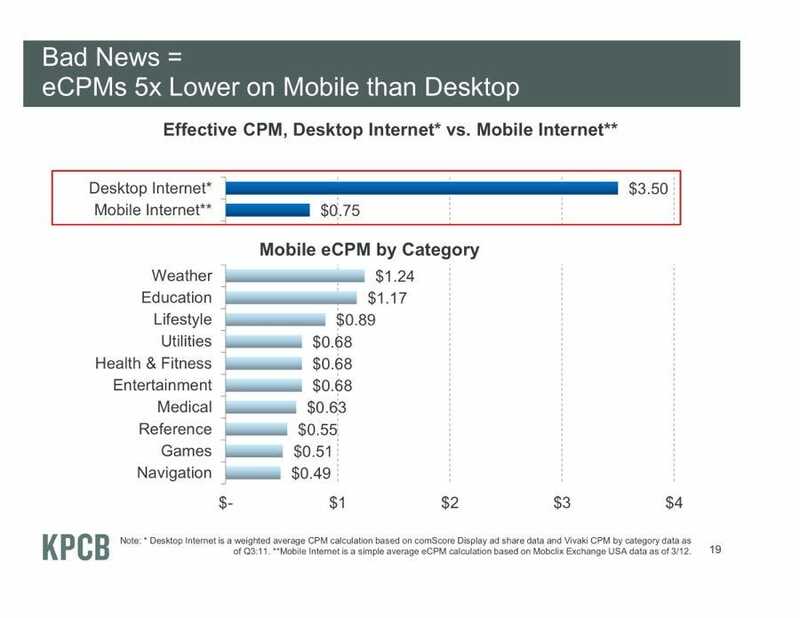 That comes with a general “mobile first” way of looking at not just content, but also ad delivery. Generally, the whipping boy for this concept has been Facebook: as more users flock to mobile — an under-monetized asset — its revenue per user (ARPU) goes down. Enter the mobile Sponsored Story. Its relevance driver has been organic generation and placement in the news feed. And that’s already playing out in the form of boosted performance over display ads. Now Facebook just has to figure out the volume (fill rates). But for many others, the mobile-first principle will come from location targeting, as its congruence with the use case similarly boosts performance and thus ad rates. For that and other reasons, I’ve forecast location-based ads to lead mobile ad revenues by 2016. We’re standing by that, but mobile local spending is taking a bit longer to lift off. Brand advertisers are still too stuck in CPM and CPC ad buys to fully embrace the CPA-based world that truly captures the value of local and high-intent mobile interactions. Meanwhile, the long-tail SMB marketplace is taking even longer to catch on, as time-starved merchants aren’t running out to launch their own mobile local campaigns. Right now those options are also limited to self-serve tools like AdWords, though it continues to expand. There are also the local “specialists” like Foursquare and Yelp, which have built solid products, user bases and engagement levels (and location data players like PlaceIQ). But their direct local monetization always seems to loom somewhere on the horizon. Earlier this year, we predicted these guys will start to monetize SMB marketing more directly in 2012, as opposed to the free or bundled mobile campaigns they’ve offered so far. In the past month, that’s finally begun to happen. After alluding to it at SFSW, Foursquare was first up to the plate with the recent launch of Promoted Updates and Promoted Specials. These let advertisers pay (CPA basis) for geo-targeted messages and deals to be pushed through Foursquare Radar and Explore tab. This was followed by Yelp’s comments to me that mobile monetization is right around the corner. That was solidified last week during the company’s Q2 earnings call, when CEO Jeremy Stoppelman said in no uncertain terms that this is indeed happening. Though the details are vague, this is a notable moment given Yelp’s mobile monetization imperative (like Facebook). Doing the math, 10 percent of its monthly uniques — 6 million users — access the service from mobile. But they make up 40 percent of overall traffic. YP is a bit further along, with clearly defined mobile local monetization that continues to unfurl (pay per call, display, sponsored listings, mobile websites). This took a step forward two weeks ago when it launched a new ad unit that infuses local calls to action. These include click-to-call, mapping and store locators, launched from right within the ad. Closest locations are provided (great for national chains) based on users’ lat/long. YP can scale this effort on the backs of its extensive advertiser base and a deep location database. The new ad units are already showing high CTRs and secondary actions (metrics here). Kurtz says advertisers are still more comfortable paying for clicks but those secondary actions that follow (calls, directions, etc) could soon compel a CPA pricing structure. And that sums up where I think the mobile local ad sector now lies. “Mobile first” will trickle down from app development, to ads, to analytics, and finally to pricing. Then we’ll be one step closer to mobile’s “closed loop” promise, and to local saving — or at least making — mobile.